We can be thankful that not all watch trends are keepers. 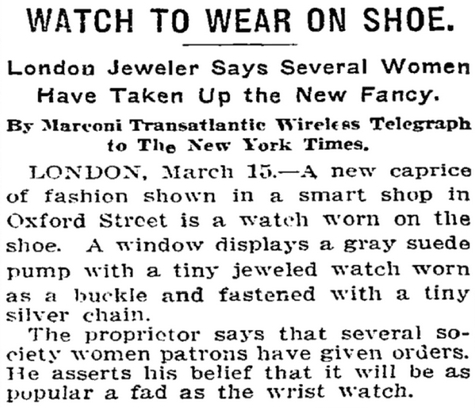 In 1913, everything could have changed as far as watch wearing was concerned, according to this New York Times article from that year. could be the next big thing. In 1913, watches worn on the wrist were a relative novelty. In 1913, pocket watches still ruled the day, but their popularity declined as World War I progressed. 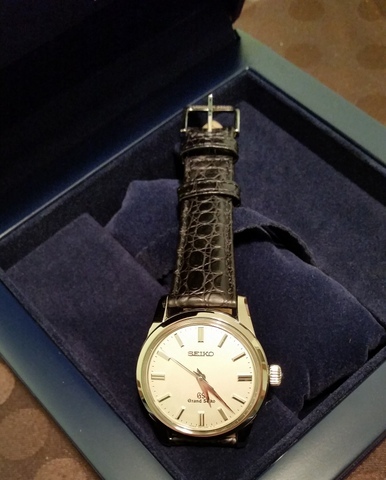 The influence of the war on the growth of wristwatches was undeniable: Watches were bought for war to time artillery and to synchronize attacks. Pilots relied on wristwatches. The war's watches had radium coated dials so that the time could be read in the dark. In war, on the wrist was simply a more useful place for a watch than in the pocket. But a little marketing here, a little advertising there, some important newspaper stories or radio broadcasts, or a celebrity endorsement and who knows -- we might all be wearing shoewatches. Fortunately, a marketing campaign for shoewatches never emerged. Instead, watch companies touted the day to day practical benefits of wristwatches, benefits that had been proven in war. But when you think about it, shoewatches might not have been a bad idea. Shoewatches would have given us decades to practice walking with our heads down -- far in advance of the time when smartphones made us do that.